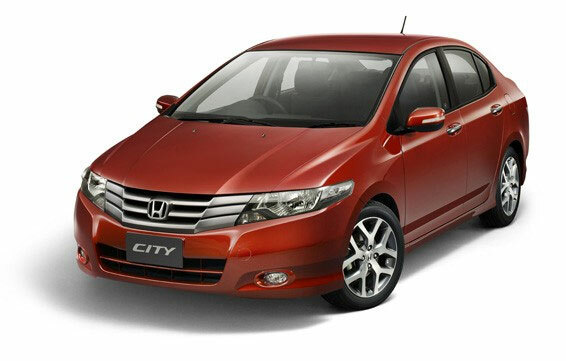 It's confirmed - the new Honda City has been released in China and India is indeed. This time a left hadn drive version as a preview to the car's official European unveiling at the Istanbul Motor Show This Octorber 2008. The European market Honda City will be fitted with a 100 PS 1.4 liter i-VTEC engine mated to a 5-speed transmission, and apparently the new City - like its European Jazz and Civic hatch siblings - will feature a 6-speed i-SHIFT automated manual transmission with steering-mounted paddle shifts will serve those who do not want to bother with a manual clutch on a daily basis. The new Honda City is as radical a change as the previous generation was from the first one launch in 1996. It was simple, low cost (to make) and could be sold at affordable prices. However, in some more mature Asian markets like Malaysia and Singapore, it was a bit too simple though it still sold well because it was cheaper than the Civic. The Honda badge helped, of course, as the brand reputation is strong and well established. To customers, the City was regarded as a direct rival to the Toyota Vios (which was also conceived as an 'Asian Car in the mid-1990s) but Atsushi Fujimoto, MD/CEO of Honda Malaysia said that position was not how Honda saw things. While there is certainly competition with the Vios. "The real 'competition' is 'with ourselves, meaning that they challenge themselves to do better in many areas relating to the product. We do not consider just sales numbers alone and we compete with ourselves to offer the best product in its class in Malaysia to our customers. We also challenge ourselves to provide the best customer satisfaction to our customers so it is much more than just selling cars to beat our competitors in volume, he explained. Honda, which is a company that has motorsports in its corporate blood, would have no problem offering better performance but there is also a need to balance things with a model like the City which is a mass market product. Its not like a Civic Type-R where the customer requirements are specific and the segment is small; with the City, the customer requirements are broader and there are those who want fuel economy and comfort and others who want sporty performance or a 'gutsy character, as the new Citys chief engineer, T. Nakamura, put it. So for the new City, the brief was to start virtually afresh and not just 'evolve the previous model. The bodystyle takes a new appearance which is called 'Arrowshot Form which is sleeker than before (the bulbous shape that provided spaciousness in the previous generation did receive some negative comments). The front end is also very different and bold with some elements from other Honda models, notably the latest Accord. Some people see influences of 'The Transformers in that grille! The new City is just 5 mm longer than the previous one but for a better interior package, the wheelbase has been stretched 100 mm. However, the stylists were mindful of visual balance and the ratio of vehicle length to height and vehicle length to wheelbase were carefully managed. The roof line is also 15 mm lower but to ensure this did not reduce headroom, the floor was also dropped by 20 mm. There is only one engine choice now; the fuel-efficient i-DSI engine is no longer offered and the new City comes only with the 1.5-litre i-VTEC engine (same as the one in the latest Jazz). With 82 kW/120 ps and 145 Nm of torque, it is claimed to highest output in its class. The i-VTEC mechanism, as most know, is a variable valve timing system which optimizes output by varying valve opening/closing times and valve lift according to driving conditions. The i-VTEC engine in the new City is improved from the old one in many ways, with changes in components, and produces an extra 7 kW plus additional torque. You can still use cheaper RON92 petrol with this engine, just like before (and also with all the ASEAN-sourced Honda models). Also dropped for this new generation is the CVT (continuously variable transmission) which was a unique selling point of the previous City. It was the first high-volume model in Malaysia to offer CVT but the surveys told the product planners that while the CVT offered high efficiency and convenience, its character was 'too smooth and not 'gutsy enough, as chief engineer Nakamura put it. Honda has by no means abandoned using CVTs and they do in other models but Mr Nakamura said they had come to the conclusion that the CVT is not appropriate for the new City and the image they want it to have which is a sportier sedan. Instead, the car comes with a 5-speed automatic transmission C a first in its class. Having the extra ratio means that the spread can be broader, allowing a higher top gear ratio to lower revs for fuel-saving. The gaps between ratios can also be closer and that allows transitions to be smoother. Also impressive is the Drive-By-Wire system which dispenses with the cable for the accelerator and instead, the drivers pressure on the pedal is converted into electrical signals which are transmitted to the throttle. The benefits C much quicker response and also better reliability. Honda Malaysia does not see great demand for a manual transmission so they are not offering it. However, Mr Fujimoto added that they have included paddle shifting (but only with the Type E version) so those who want to shift gears themselves can still do so. But its not the same, is it, and with the Vios having a manual transmission option, perhaps Honda Malaysia should think again about the option for Malaysia. The chassis is still a straightforward affair with the suspension configuration still the familiar independent MacPherson struts up front and a torsion beam rear suspension, typical for cars in this class because it is relatively low-cost. Its an effective layout though and in conjunction with increased rigidity of the body, the engineers have also made changes to various suspension elements for improved ride and handling. For example, at the front suspension, the tilted kingpin axis has been rotated rearwards allowing for an enlarged caster angle and increased caster offset to improve straight-line stability. At the rear, a reduced spring lever ratio and increased trailing arm bush capacity provides more supple riding comfort.